Jack’s cat tree — set up right in front of the sliding glass door in our living room for easy bird- and human-watching — has seen much better days. The carpet on the top level is bare in a few spots, and though I vacuum it frequently, it always seems to have about a cat’s worth of fur scattered across it. Yet, Jack loves that cat tree and scratches it multiple times per day. I consider it an eyesore, but I know I should leave it right where it is, because Jack gravitates toward it instead of the couch, which sits about 10 feet away. Such a strategy will likely continue to protect my couch. 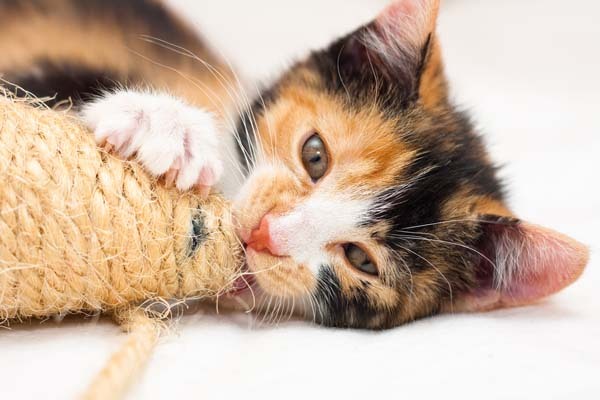 Pam Johnson-Bennett, a certified cat behaviorist, says that keeping a suitable scratching surface in high-traffic areas of the house can help encourage appropriate scratching post behavior. 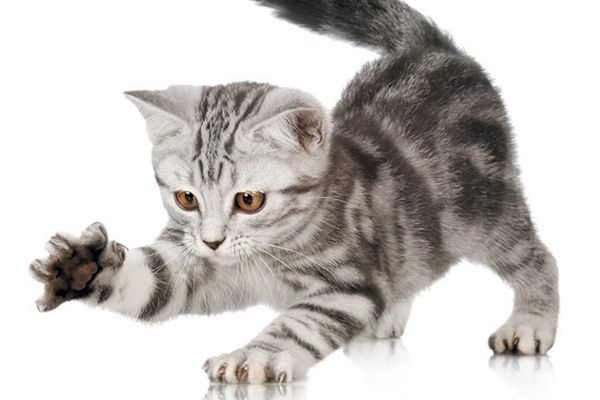 A gray kitten getting ready to scratch. Photography by GLOBALP/THINKSTOCK. Kittens begin to develop their scratching preferences from a young age. 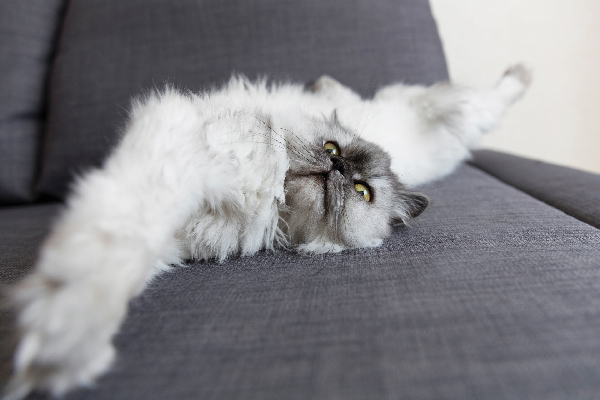 While most cats stretch upward to scratch (such as on a cat tree or post), some cats prefer to scratch a horizontal surface like the base of a cat tree or a cardboard pad. And while many cat trees are covered with carpet, your cat may prefer a different surface, such as cardboard or sisal rope. Don’t worry: If your kitten starts scratching on an item that you’d prefer to keep off-limits — such as the living room couch — you can easily redirect him to a more appropriate item while he’s still learning scratching behaviors. Place a scratching post next to the area where he’s scratching, and make the inappropriate area as unappealing as possible (block his access, or cover the spot with sticky tape or tinfoil). Praise your kitten when he uses the scratching post, then keep it nearby when he starts using it consistently. Do this: Cats need to scratch for multiple reasons. If your kitten doesn’t have a suitable outlet for his scratching behaviors, he will find another spot to do so. Avoid unpleasant scratching situations by accommodating his needs from the very beginning. Our feline crew does a decent job marking their territories on their scratching posts and cat trees, and to encourage that behavior we have four scratching posts positioned throughout the house. Two are in our open-plan living and dining room area, where the humans of the household spend most of our time, and two are in the master bedroom, where the cats spend most of their napping time. Johnson-Bennett says that strategy works best for multi-cat households. Don’t worry: If you find what look like claws near your cat’s scratching post, don’t panic. One of the reasons your cat scratches is to keep his claws in good shape, and the act of scratching helps remove the outer layer of material from his claws. 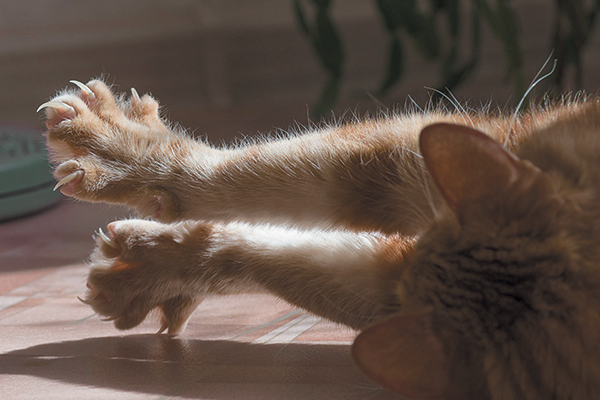 Do this: You can help keep your cat’s claws in good shape by trimming them regularly. This may also help protect more delicate fabrics and upholstery in your home from becoming snagged by your cat’s claws. Most cat experts, however, discourage having cats declawed, as the surgery can have painful lasting effects. As your cat ages, he still needs to scratch to exercise his muscles and stretch his limbs. For a senior cat, having a scratching post readily available can make it easier for him to continue these healthy behaviors. Don’t worry: As Johnson-Bennett says, don’t be alarmed if your cat suddenly races through the house to begin furiously scratching his post. Instead, be grateful that he prefers his post to your favorite lounge chair. Do this: Because your cat needs to stretch his muscles when he scratches, make sure the post is tall enough for him to stretch out. While those cute little posts at the pet store may work well for a young kitten, your senior cat needs a taller post so he can stretch to his full length. 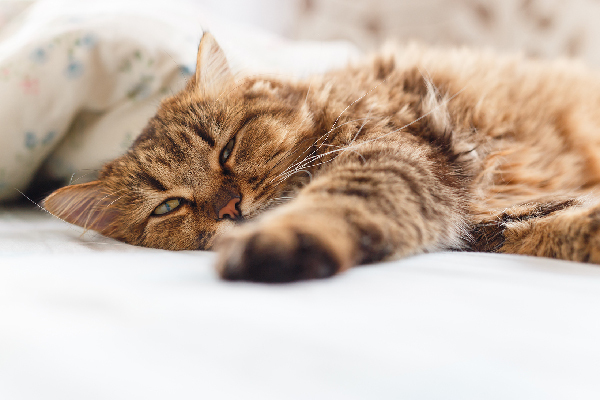 If his post isn’t tall enough, your cat will likely seek out a taller place to scratch — including your fabric headboard. A lifelong cat owner, Stacy N. Hackett writes frequently about cats, cat breeds and a range of pet-related topics. 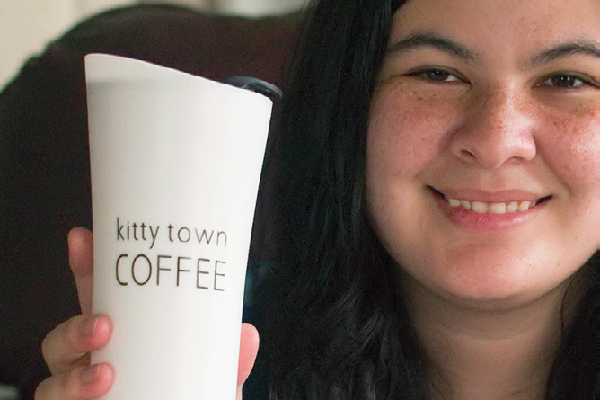 The inspiration for her writing comes from her four cats — Jack, Phillip, Katie and Leroy —and her Cocker Spaniel/Labrador Retriever mix, Maggie.